at 115 VAC 60Hz. This is a fully isolated in line double conversion system with input surge protection. 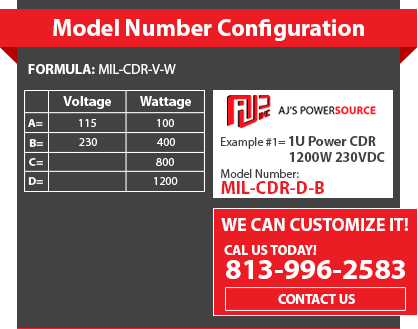 AJ’s Power Source Inc. is pleased to announce the release of our new AERO-CDR SeriesTM. This new series is a Ruggedized Aerospace compliant power conditioning system built for deployment and11 operations equipment. These units are available to all the Aerospace Industry, homeland security and government contractors. Built for a Very Low EMI signature and very High Reliability this power system will keep your product up and running for many years to come. The AERO-CDR SeriesTM is a 1U power conditioning system that provides up to 800 Watts at 115 VAC 60Hz. This is a fully isolated in line double conversion system with input surge protection. The Aerospace Ruggedized Universal Input Tactical Power Conditioner Has Unique Features Designed to Meet All the Aerospace Standards. This system has many unique features such as over voltage, over current, over temperature and short circuit protection. Stainless steel side rails allow for multiple rack depths and the system has field replaceable filters and fans. This system also contains a 24VDC emergency input that will allow for the system to be powered from any 24VDC source if or when AC inputs are not available. EMI/EMC – The conditioner system has been designed to comply with all of the radiated emissions, susceptibility and conductive emissions requirement of the applicable sections of MIL-STD-461E. These techniques have been used successfully by AJPS to comply with these standards many times in the past. •	Metal Chassis with gaskets on all non sealed interfaces. •	EMI Filters on all input and output power lines. •	Internal circuitry shielded and isolated. •	Ground Planes used for noise isolation. •	Connectors area isolation from Conversion Area. •	External line filter and shielded cables required. AJPS’s has been supplying high end Aerospace Transformers Power solutions to the NASA, Airborne, UAV, Imaging, Satellite and Helicopter for over 20 years. All of AJPS’s operations are monitored and controlled by an ISO 9001:2000 based quality systems. To learn more about our custom capabilities please, Contact us online or call our main office at (813) 996-2583 our experienced Representatives will provide you a custom Quote for your custom power requirements. AIR FILTERS – Air filters should be placed on a regular maintenance schedule. Suggested inspection should be once a month for any outdoor or high dust environment. The filters can be washed with warm water and soap or blown out in the reverse direction with an air compressor. Regardless of cleaning and inspection processes the filters should be replaced one a year minimum. OUTPUT POWER CABLES – Output power cables are available upon request. The output power cable will need to be shielded from source to termination if system is required to meet MIL-STD-461E. Input Voltage: VAC – 100-264, 47-440Hz. Hold Up Time: >16 mS at 80% Load. Operating Temperature: –20 to 60ºC. Storage Temperature: -40 to 85ºC. Over Voltage Protection: 130% Standard. Short Circuit Protection: 130% Standard. Thermal Protection: Over Temperature Shut down 70ºC +/- 5ºC. Isolation: Input to Ground and Input to Output. Output Voltage: 115 VAC or 220 VAC.